And unlike a simple copy, your full stack deployment package can be rolled forward, rolled back, or it could even jump versions. So when production is 5 versions behind and you want it up to the most recent release, DeployHub does that incrementally (including the database updates), reducing the time and risk associated to the release. DeployHub’s reports show what has changed providing an audit trail that makes even the grumpiest production control team happy. DeployHub integrates with CircleCI to provide 100% repeatable continuous deployments across the entire CircleCI pipeline. Using the CircleCI DeployHub Orb will allow you to drive the continuous deployments, with DeployHub doing the heavy lifting, without custom, one-off deployment scripts. DeployHub matures your CircleCI pipeline to break down the wall to production updates. DeployHub provides reports and insights for individuals on the production control side of the house. This transparency gives the production control teams what they need to accept faster, more iterative software updates. Instead of having deployment scripts for each state in your pipeline, the DeployHub Circle CI Deployment Orb creates a release process that includes cataloging, publishing, packaging and deploying software updates on an agile ‘iterative’ basis in a repeatable way. You no longer need to perform monolithic releases, (the norm for scripted solutions) or manage different scripts for different versions and environments. And while you are thinking this will break the budget in terms of cost, let me stop you there. DeployHub is an open source solution, hosted for free by DeployHub Inc. You can start with a single project and begin learning how much faster you can move when you fully automate (dump the scripts) software deployments. As we move into microservices and site reliability, the concepts of monolithic releases will go away. We will instead welcome a new era of software development that focuses on small changes, microservices, instead of a complete application. For this reason, DeployHub allows you to catalog, publish, and share microservices across a domain driven design. With DeployHub, you can start deploying your updates incrementally, and begin seeing your software updates as changes to individual components. DeployHub will always show you what your monolithic equivalent looks like, but your releases will finally be agile. ApproveJob- Allows CircleCI to call DeployHub’s approval process to approve an application version to be moved to the next stage of the pipeline. The approval occurs as the UserID is passed from CircleCI to DeployHub. Depending on your DeployHub configuration, you may need to call the ApproveJob. This would happen if an approval gate is defined in DeployHub. CircleCI will pass the application version and the ‘Move’ task to DeployHub. MoveJob – Executes the DeployHub ‘Move’ task which promotes or demotes an application version to a different pipeline state. 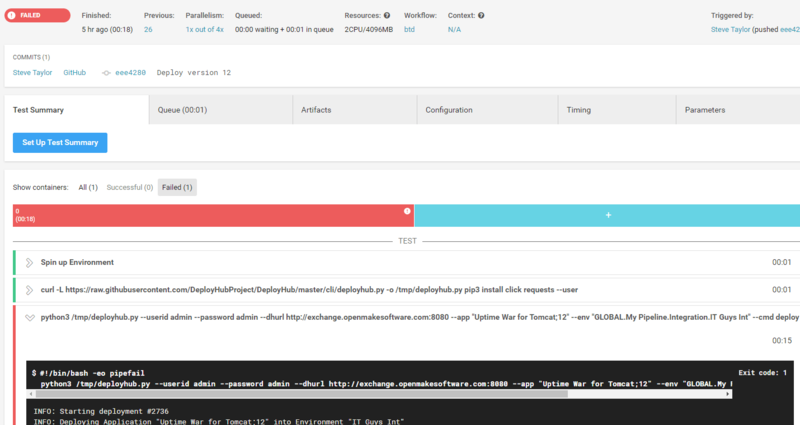 DeployJob- Deploys an application version to a specified environment. CircleCI will pass the application version name and environment to DeployHub. Note: Future release will include the ability to automatically update a component version to initiate a new application version. You do not need to use the ‘ApproveJob ‘or ‘MoveJob’ tasks. The use of these tasks is determined by how you define DeployHub. DeployHub has an ‘Approval’ process as well as a ‘Move’ process that tracks where an application version is in the pipeline. You would generally perform a ‘Move’ and then a ‘Deploy.’ The DeployJob is the main DeployHub task that needs to be called. To start using the DeployHub CircleCI Deployment Orb, you will need to create a .circleci/config.yml to define your workflow to CircleCI for that project. That workflow will define calls to the DeployHub jobs and define the variables such as Application Version, Environment, UserID and Password that will be passed to the DeployHub CircleCI Orb. DeployHub and CircleCI have a two-way logging communication. The DeployHub CircleCI Deployment orb includes the ability for all logs about software deployments to be reported in both solutions. CircleCI can report to DeployHub when deployments are ready to be executed, with DeployHub reporting back the status of the deployment. For most users, CircleCI remains their primary location to find results and logs. On the production side of the equation, Operation teams use DeployHub to manage environments and view reports. These reports include a full continuous feedback loop that shows the full ‘Value Stream’ starting at your Build Job and showing what application components were updated and to what end targets they were deployed.